Published Tuesday 2 August 2016 On Friday, 29 July, Ealing Council launched a Gruffalo inspired nature trail in the borough. 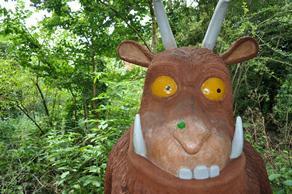 The brand new Gruffalo trail at Horsenden Hill features a 7ft Redwood wooden sculpture of the Gruffalo and four smaller Sweet Chestnut sculptures of Mouse, Fox, Snake and Owl, all hidden along the adventure trail pathway for children to explore and discover. Based on the best-selling children's picture book by Julia Donaldson and Axel Scheffler, the Gruffalo is the story of a cunning mouse’s walk through the deep dark wood where he encounters a variety of dangerous creatures who all want to eat him, but he scares them off with the idea of the 'imaginary' Gruffalo. Councillor Bassam Mahfouz, cabinet member for transport, environment and leisure, said: “In Ealing we have some of the most enviable outdoor spaces across all of London. With the opening of the Gruffalo nature trail at Horsenden Hill, I know that kids of all ages - even adults - will be excited to lace up their walking boots and hit the trail all set for their very own Gruffalo adventure. There are 5 interpretation boards alongside the sculptures which aim to encourage children to connect with and learn about their local woodland. The project was funded through Ealing Council Parks and a Perivale ward forum contribution, ﻿licensed by Magic Light Pictures and the sculptures were carved by chainsaw artist Dan Cordell.